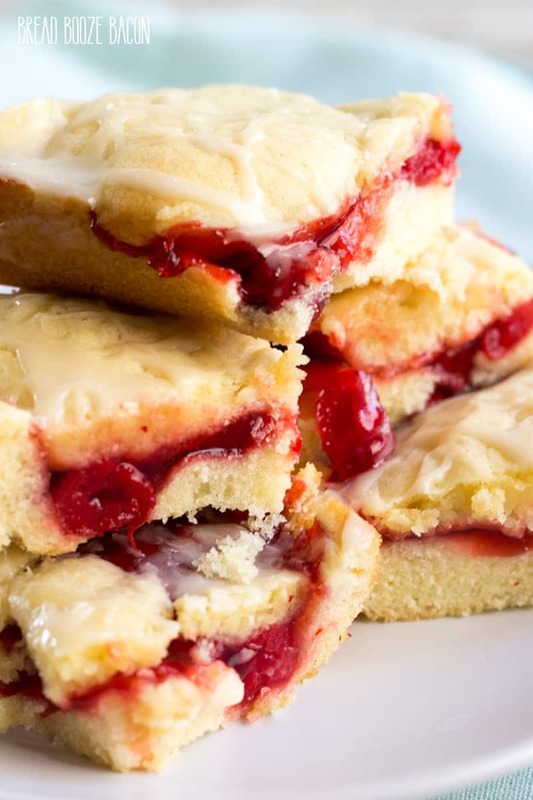 Cherry Pie Bars are an easy to make treat with all the pie flavors you love in bar form! 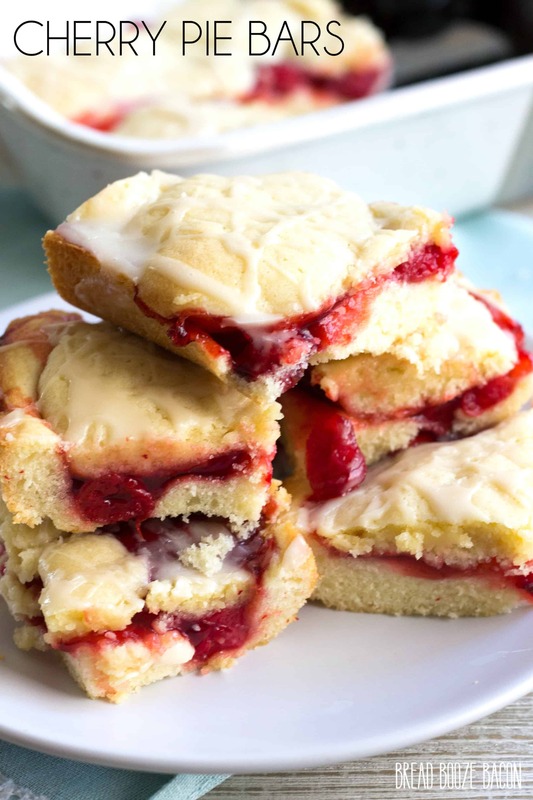 This simple dessert recipe is sure to become a summer favorite! Dessert bars are one of my favorite easy desserts to make. 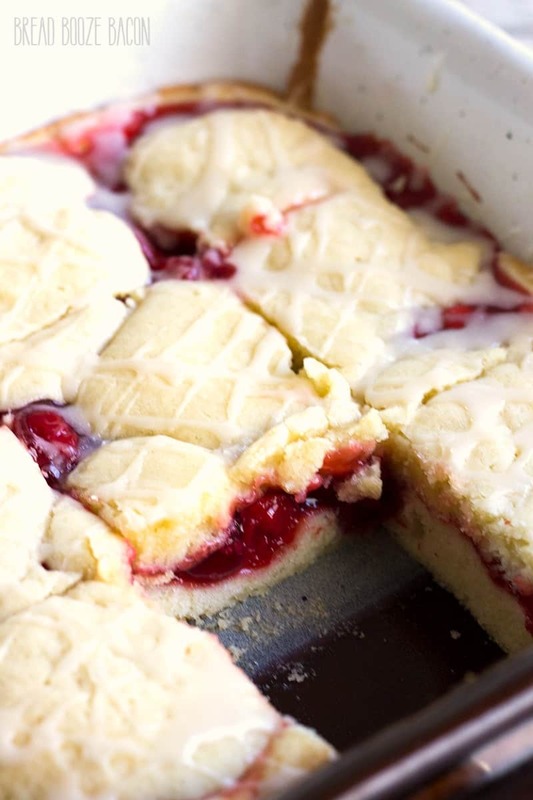 You throw a big batch into a pan, bake ’em, and cut them into little (or big) pieces. No rotating pans through the oven ump-teen times like with cookies. (Even though chocolate chip cookies are totally worth it!) 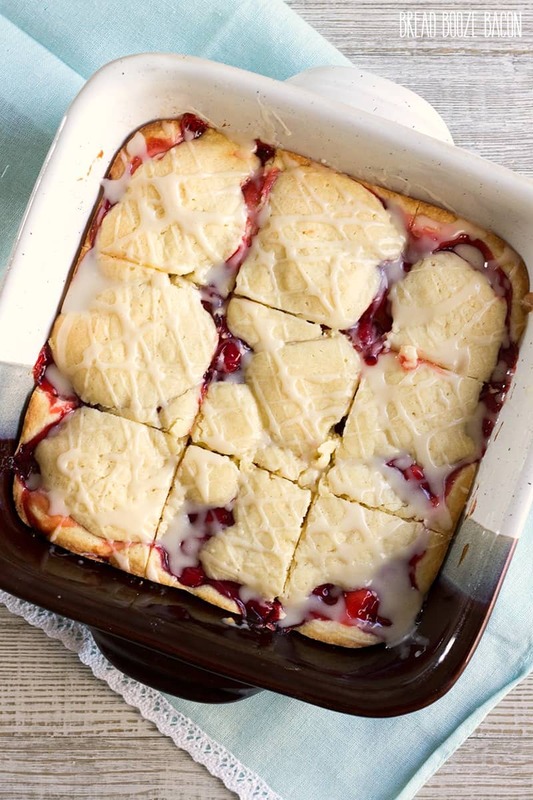 One of my husband’s favorite summer fruits is cherries, and he’s been extra awesome lately, so I whipped up these cherry pie bars for him! I mean really, who can resist juicy, sweet cherries?! As much as I love making pies, sometimes I want the flavor without the work. These bars totally hook it up. Yes, I know the dough isn’t very similar to a pie crust, but the mild flavor carries the cherry flavor wonderfully. You can up the ante on your bars with an easy vanilla glaze, and if you want a few sliced almonds on top. These bars are great for serving a crowd! I made a smaller batch since it’s just Mike, the boys, and me, but you can easily double this recipe if your feeding a large group. 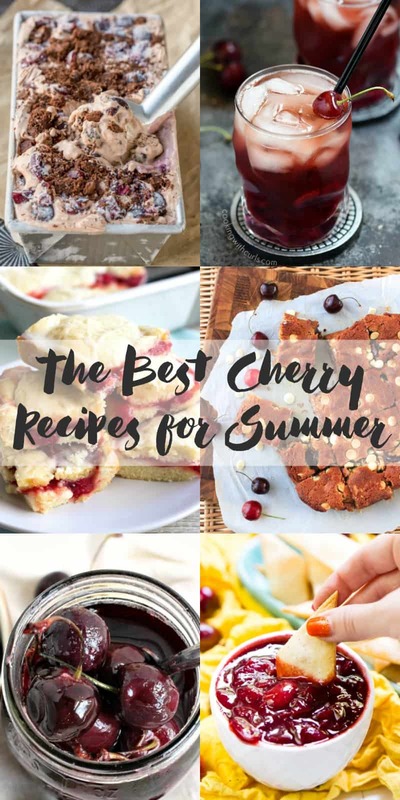 If you love cherries like we do, you’re in luck! 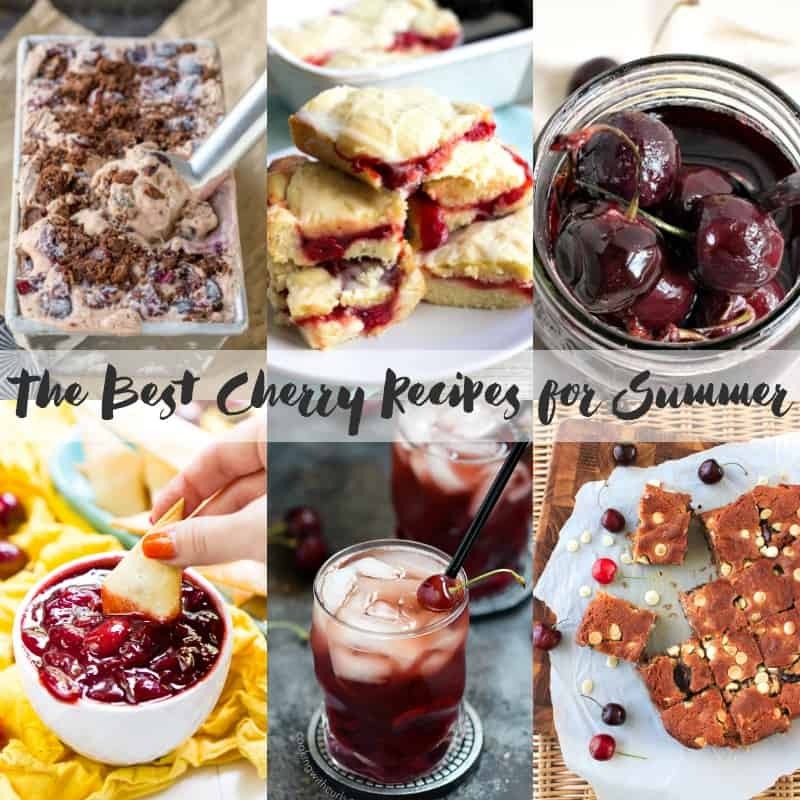 This month’s feast & devour recipes are loaded with cherries to satisfy your cravings. From dip to drinks, we’ve got you covered. Preheat your oven to 350 degrees F. Coat a 9-inch x 9-inch baking dish with non-stick cooking spray. In a large mixing bowl, beat together the butter and sugar until fluffy, about 1-2 minutes. Add the eggs and vanilla, and beat until combined and smooth. Place ⅔ of the dough into your prepared baking dish. Use a rubber spatula or the back of a spoon to spread the dough into an even layer. Pour the cherry pie filling over the dough and spread out so the dough is covered by the pie filling. Place large dollops of the remaining dough over the top of the pie filling. Bake for 30 to 35 minutes, or until the dough is set and the edges of the bars are golden brown. Carefully remove the bars from the oven. Cool on a wire rack. When the bars are cool enough to handle/eat, prepare the glaze. In a small mixing bowl, whisk together the powdered sugar, milk, and vanilla until smooth. The glaze will be runny. Cut the bars into 9 equal pieces. Serve immediately. This recipe can be doubled and baked in a 9-inch x 13-inch baking dish at 350 degrees F for 30-35 minutes. These bars are best within the first 24 hours. After that, the moisture from the pie filling will cause the bars to take on a spongy texture. Stuff about signing up for emails!